London: Simpkin and Marshall, et al. This extensively illustrated volume by science and technology writer and lecturer, Charles Frederick Partington (d. 1857? 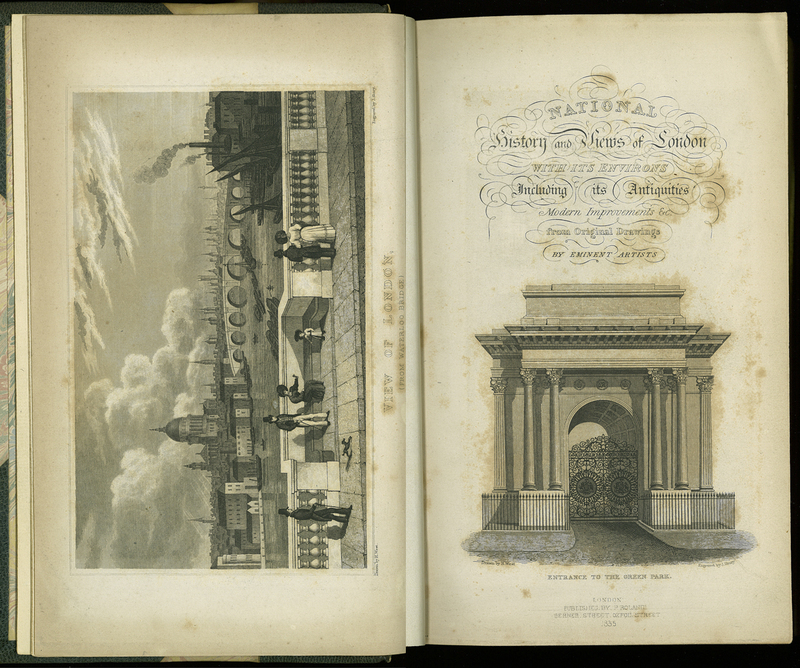 ), contains over 300 steel engravings of the city and its environs. This frontispiece shows a topographical view of London from Waterloo Bridge looking towards Blackfriars Bridge. The tallest building in the picture is St Paul’s Cathedral. The landscape view gives the reader, who may never have visited London, an idea of the immensity of the City. Edited by C. F. Partington, “National History and Views of London and its Environs; Embracing their Antiquities, Modern Improvements, &c… Vol. I,” ourheritage.ac.nz | OUR Heritage, accessed April 20, 2019, http://ourheritage.ac.nz/items/show/10652.